**Before you read on, please take a look at my note regarding English/Metric measurements. 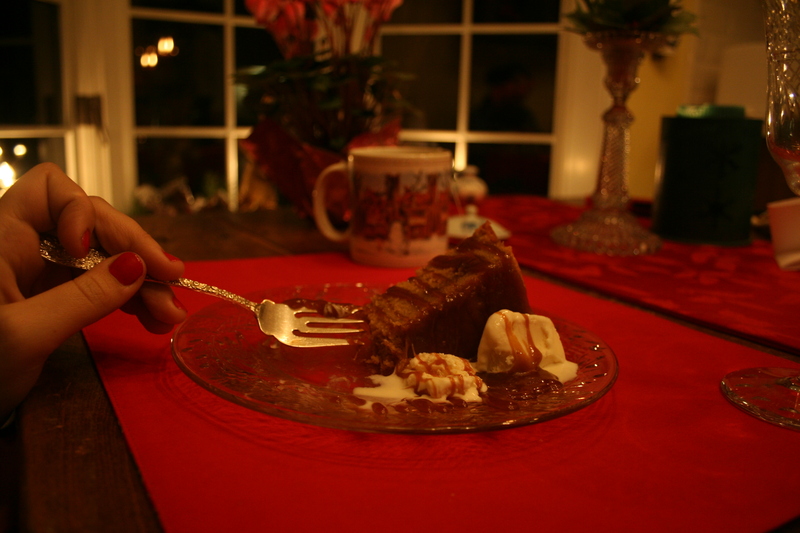 For Christmas, my family asked me to take care of dessert – typical, given that I love sweets. In keeping with their request, I decided to make a warm apple cider bourbon cake. It’s a simple, moist gateau topped with an apple caramel that is best served with ice cream and perhaps a cup of tea (or a little sip of calvados…or pommeau….). The timing of this cake can be a little tricky. The sauce needs to be prepared FIRST as it constitutes a layer of the cake as it cooks. The sauce will take at most 45 minutes, less depending on the strength of your stovetop. In a large pot (with tall sides), combine the cider, bourbon, brown sugar, corn syrup, vinegar, cinnamon and vanilla and put over medium high heat. I suggest that you microwave the corn syrup to make it easier to pour…since it can be very stubborn and refuse to pour out of the measuring cup. Stir all of these ingredients together until the sugar has dissolved and the entire mixture comes to a boil. Allow it to bubble for about 10 minutes. Then, add the heavy cream and reduce the heat slightly to prevent the mixture from curdling or separating. Allow the caramel to boil for roughly 25 minutes. The sauce will thicken and the bubbles will take on a glassy sheen. 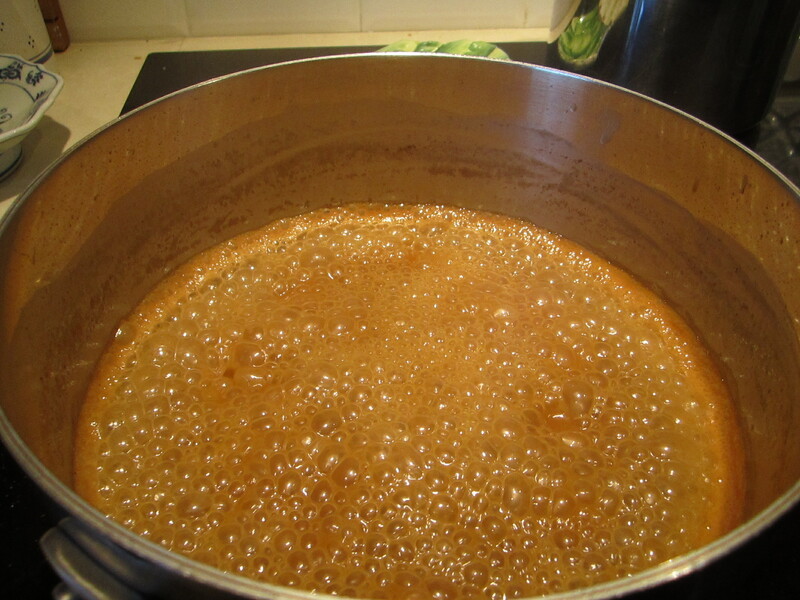 Once you have reached this point, the caramel sauce is ready and can be removed from the heat. As it cools, it will thicken more. Preheat the oven to 350 F. Line a 9-inch round cake pan with parchment paper (I trace the pan and then cut the paper to size) and cover the sides with butter. In a large bowl, combine the flour, salt, baking powder and baking soda (cinnamon as well for those that like a little extra spice). In a glass measuring cup, mix the apple cider, canola oil and bourbon. Cream the butter in the mixmaster (or if you are like me and sans mixer, use your whisk and mix until the butter is light and fluffy). Add the brown sugar and vanilla and continue to whip the butter until it has lightened in color. Beat in the eggs one at a time, making sure everything is well incorporated before adding the second egg. Add the flour mixture with the cider mixture, alternating one with the other until it has been completely mixed in. You will want to turn the mixmaster to it’s slowest speed to avoid a flour cloud. If using a whisk, simply stir, do not whip, for best results. TASTE. If the batter doesn’t taste good, the cake won’t either. If you like more bourbon, this is the time to add it. I often put more in than I have noted above (but not much !) as the alcohol cooks off in the stove. The same goes for cinnamon and vanilla. Spread 2/3 of the batter in the prepared cake pan. 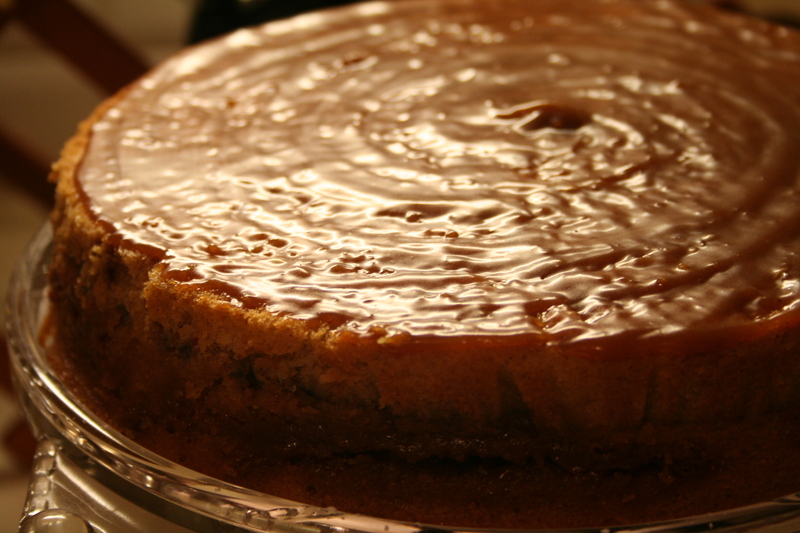 Drizzle in a circular motion, moving from the center of the cake outwards, the caramel mixture that was made earlier. You made need to reheat it – do so over the stove on a low setting to avoid separation. IF THE CARAMEL SEPARATES – have no fear ! It will taste just as good – simply make sure you mix it well before serving. In any case, once the batter has been covered with a layer of caramel, put the remaining third of batter on top, being careful not to blend the three distinct layers together. The cake pan will be very full, so I often place the cake pan on top of a cookie sheet just in case it overflows…this way you avoid a big mess in the oven. The cake will cook for about 40 minutes or until springy to the touch (and a lovely golden brown color on top). Let cool for 10 minutes in the pan before running a knife around the edge and inverting the cake onto a cooling rack. When ready to “ice” and serve, remove the parchment paper and place on a platter (I used a cake stand but I often just use a plate). Warm the remaining caramel and pour 1/2 over the top of the cake. To serve, cut cake and pair with a scoop (or more…) of vanilla ice cream. Pour a spoonful of the remaining caramel sauce over the cake and ice cream and enjoy ! Okay…OKAY. I have caved. After multiple Facebook statuses, conversations, photos and debates about food, I have decided to succumb to the inevitable (ou l’inévitable) and create this little site to document my culinary adventures. Rather than simply noting my recipes on my customary white printer paper and papermate blue pen to be filed away in my cookbook, I am entering the modern world and posting them here – complete with photos, anecdotes, complaints and alterations. Here’s the scoop : Posts will be made (as often as possible) in both English and French. To find those posts in French (complete with French measurements), click on the category “français.” For those in English…well, choose English. The recipes posted are mine – I have found them from various sites (Epicurious being a favorite) and altered them accordingly…for better or for worse. If I am testing a recipe, I will post the source. If I’ve made it up completely…you’ll know.